Wait, you are kidding right?! 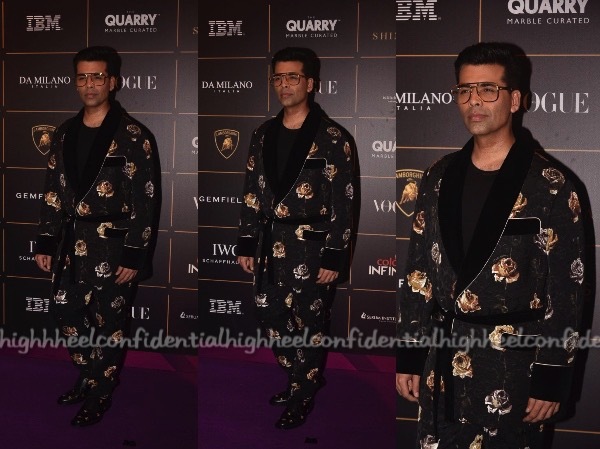 Wondering if Karan Johar is graduating to dress up like Hugh Hefner on purpose ? I don’t get how this man is considered stylish! This look is one of his WORST! This isnt my idea of standing out. Hugh Hefner died and left his bath robe collection to K Jo. I don’t care if it’s D&G – that’s a glorified night suit with a housecoat. A different era, with velvet drapes and a cigar , this would look ok as he pottered around his manor. In 2018? Hell to the no! ye night suit mein aaya hai kya? NO. Monstrosity of a suit. Some things need to stay in the closest !! HILARIOUS!! He has lost it! It really pains me that he has become some kind of fashion carricature wherein he has the intelligence to be so much more well dressed then what he does these days . Hey man stop pouting will ya?